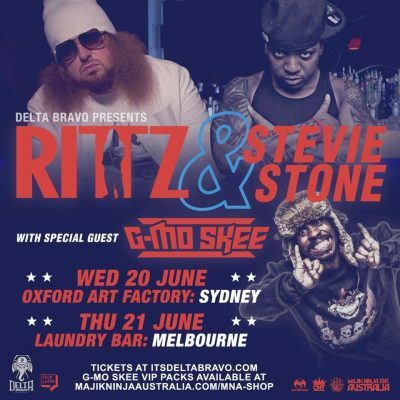 News > Underground News > Rittz, Stevie Stone, and G-Mo Skee Coming to Australia! Rittz, Stevie Stone, and G-Mo Skee Coming to Australia! If you’re reading this post from Australia, then we’ve got some devastatingly fresh news for you! You may already know that Rittz and Stevie Stone have 2 dates booked for Australia in June. It has just been announced that G-Mo Skee has been added to the roster as well! Our very ownG-Mo Skeeis joiningRITTZ&Stevie Stonenext month for two big Australian shows! Limited G-Mo VIP’s (DOES NOT INCLUDE SHOW TICKET) will be available tomorrow at the MNA Shop! Those two dates are coming up fast, so don’t sleep on buying those tickets!